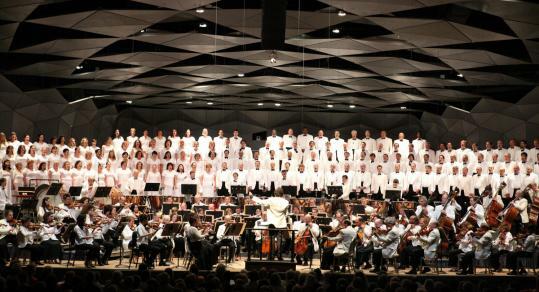 LENOX - Plenty of average-size orchestral works can seem a bit dwarfed by the proportions of Tanglewood’s Koussevitzky Music Shed, but not the Berlioz Requiem. The piece demands a massive chorus and orchestra and four separate brass bands. On Saturday night, these bands were placed in the wings of the stage and on the floor near the sides of the Shed, effectively stretching out the width of the orchestra to wide-screen dimensions. Berlioz was not a man of strict religious faith, but his “Grand Messe des Morts,’’ as it is officially titled, still seemed to pour out of him with the zeal of a true believer. (“My head seemed ready to burst,’’ he wrote in his memoirs, “with the pressure of my seething thoughts.’’) If Berlioz had a burning desire to adapt and set the Requiem text, to create sonic imagery for events as dramatic as the Last Judgment, he nonetheless channeled it into a work that moves with the solemnity and gravity of ancient rituals. A good performance holds the piece’s marvelous contrasts - its grandeur and intimacy, its moments of high drama and of priestly austerity - in a meaningful tension as part of a larger architectural whole. On Saturday, Charles Dutoit’s account with the BSO had its notable moments but overall felt more diffuse than charged by any productive tension. Dutoit’s job was in a way thankless since he was of course replacing James Levine, and many present had no doubt heard the BSO’s Levine-led performances of Berlioz’s “Damnation of Faust’’ or “The Trojans.’’ Those inspired outings showed off Levine’s gift for shaping Berlioz’s massive choral textures and kaleidoscopic orchestral writing into forceful narratives with their own expressive arc. They also showed how a conductor’s palpable involvement with the music could bring out the best from singers and orchestra alike. His absence on Saturday was felt. The Tanglewood Festival Chorus had some uncharacteristic moments of rocky intonation, as did tenor soloist Russell Thomas, whose stentorian delivery detracted from the charms of his sweet-toned tenor. Among the more successful moments was the ethereal choral singing in the Sanctus, and the fierce climax of the “Dies Irae,’’ with the four brass bands ablaze and no fewer than six timpani players thundering across the back of the orchestra. The following afternoon, Jennifer Higdon’s “Loco’’ made for a gleaming and rambunctious curtain-raiser, and Miguel Harth-Bedoya’s conducting deftly underlined the piece’s rhythmic flair. After intermission, he might have gotten more from Tchaikovsky’s Symphony No. 6 with less tinkering and an over-italicizing of the work’s native pathos. Between the two works, violinist Joshua Bell, a perennial Tanglewood favorite, was the soloist in Bruch’s “Scottish Fantasy.’’ This was clean, suave, tonally luxurious playing with a sense of nothing in particular at stake. The music seemed of a piece with the beautifully pleasant weather. The crowd loved it. But Bell is capable of much more. It can be the ultimate trap for an artist of his talent to enjoy such boundless popular success while risking so little. Bell was recently named music director of the Academy of St. Martin in the Fields. This is the time for him to challenge himself artistically, to chart some fresh exploratory projects from his new post, and to enjoy the fact that his legions of fans will still be happy to come along for the ride.